NAB Eye Hospital run by Lions Comprehensive Eye Care Foundation,a charitable trust,was established in year 1992 with the aim of giving a comprehensive eye care to the rural patients either free or at a subsidized rate. A plot of land was purchased and hospital's own building was constructed. 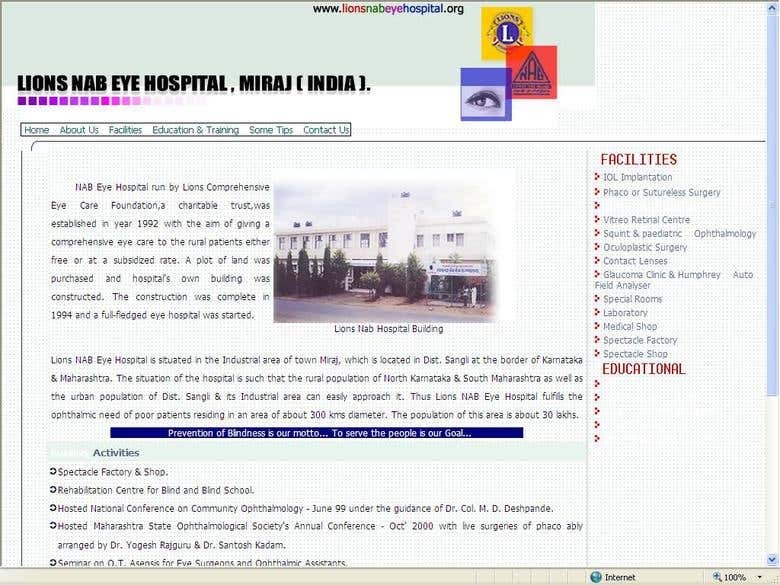 The construction was complete in 1994 and a full-fledged eye hospital was started. Lions Nab Hospital Building Lions NAB Eye Hospital is situated in the Industrial area of town Miraj, which is located in Dist. Sangli at the border of Karnataka & Maharashtra. The situation of the hospital is such that the rural population of North Karnataka & South Maharashtra as well as the urban population of Dist. Sangli & its Industrial area can easily approach it. Thus Lions NAB Eye Hospital fulfills the ophthalmic need of poor patients residing in an area of about 300 kms diameter. The population of this area is about 30 lakhs.